Join me on 25th-29th May 2019 for this dramatic 5-day (4 nights) Wild Light Faroe Islands Landscape & Seascape Photography Workshop. The Faroe Islands may be small in area, but you’ll find dramatic views at every turn and we will cover a lot of ground on this tour. Our accommodation is high quality hotel en-suite single occupancy for 4 nights at Hotel Streym in Torshavn. Breakfasts are included. Alcoholic drinks, lunches, snacks and evening meals are not included. Special dietary requirements can be catered for. We will usually dine together in the evenings, or you may wish to try one of the restaurants in Torshavn if you prefer. The hotel is situated near the town centre, the administrative centre of Tinganes and the Marina are close by and fascinating areas to explore. Hotel Streym is the perfect base for our Faroe Islands photography workshop. We will travel to the extremities of the group of Islands that are connected by bridges and sub sea tunnels during the workshop. Our groups are intentionally small in number and restricted to single figures for maximum personal attention, no single supplements apply. Transport to all photography locations for the duration of the workshop with guiding and personal tuition is by Steve Walton. Image reviews and post processing tuition can take place in the hotel bar in the evenings for those who feel they would benefit from this. This extensive tour will give you a Faroe Islands experience to remember with dramatic mountain landscapes and impressive seascapes, changing light and weather and the unique culture, flora and fauna and settlements of the islands. Those who have travelled with me before on previous Wild Light Photography Workshops will know my penchant for spontaneity and there is always room for the unexpected ‘off piste’ excursion to seek out hidden gems and local people. For full details of our Wild Light Faroe Islands Photography Workshops, please email me direct or use the Contact Form. Svinoy, from one of the locations we shall visit on Day 3 of our itinerary. 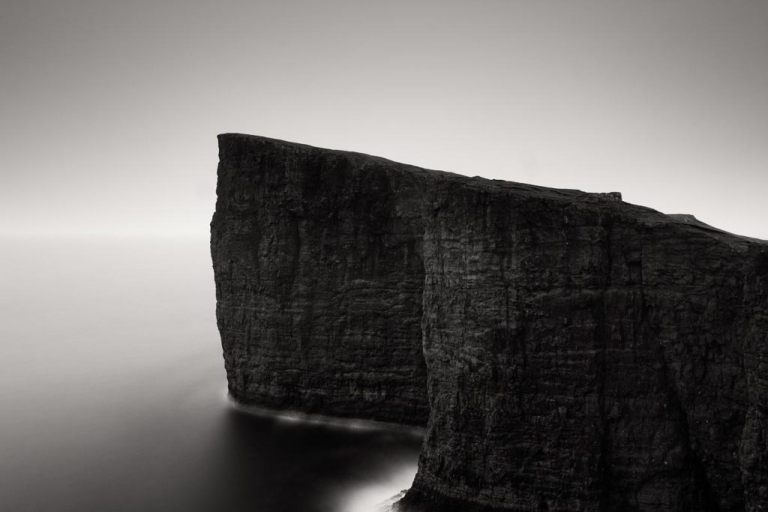 Image by Steve Walton FMPA FBIPP from our April 2017 Faroe Islands Workshop. Trælanípa, one of the iconic Faroe Islands locations we shall visit on Day 4 of our itinerary. 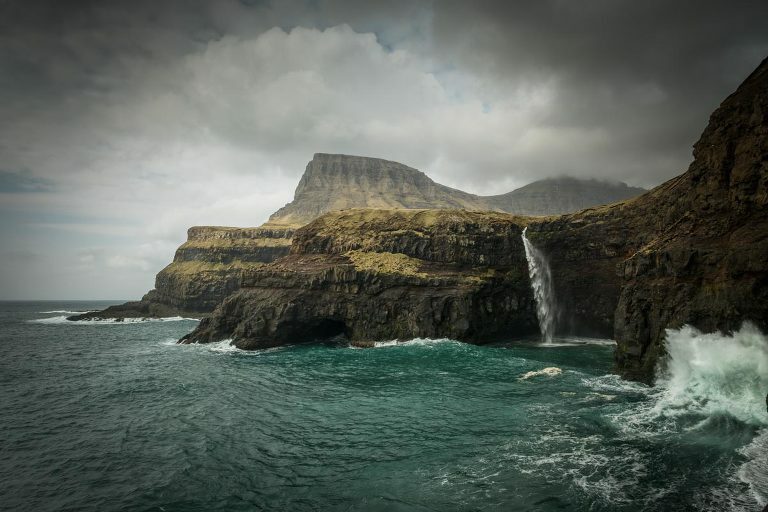 Image by Steve Walton FMPA FBIPP from our May 2018 Faroe Islands Workshop. Trælanípa at Leitisvatn, the place where worn-out slaves were thrown into the sea in Viking times. Mulafossur waterfall at Gasadalur, a stunningly beautiful location on Day 1 of our itinerary. 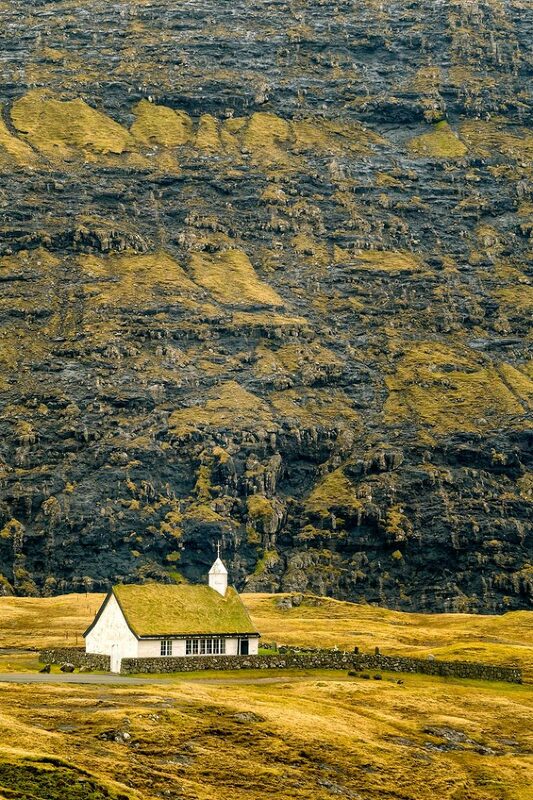 Saksun Church, one of the iconic locations we shall visit on Day 2 of our itinerary. Fugloy, just one of many amazing views on Day 5 of our itinerary. The Cleft of Gjogv, from Day 5 of our itinerary. All images above were made with Fujifilm X-T2 and X100F cameras on my previous Wild Light Photography Workshops in the Faroe Islands. These locations and many more are included in the May 2019 workshop itinerary, as outlined below. Day 1: Saturday 25th May 2019. If you have booked into Hotel Streym for the previous night (Friday May 2th), we will meet for breakfast at 8.30am. Following introductions, we will head out for the day to numerous locations on Vagar including Leitisvatn, Bour, views of Tindholmur and Mulafossur at Gasadalur. Day 2: Sunday 26th May 2018. Following breakfast, we will travel to the turf-roofed settlement of Saksun, stopping off at numerous locations en-route. Saksun is an incredibly beautiful place and the single track road along the valley offers many locations along the way. Day 3: Monday 27th May 2018. Following breakfast, we travel northwards across Streymoy, Eysturoy, Bordoy & Vidoy to Viðareiði, the most northerly settlement in the Faroe Islands. On the way to and from this spectacular location, we’ll be taking in photographic opportunities at numerous locations for a comprehensive day-long tour to give you a good overview of the varied landscapes and vistas the Faroe Islands offer. Day 4: Tuesday 28th May 2018. Following breakfast, we walk along Leitisvatn, the Faroe Island’s largest lake, to the world-famous iconic and dramatic locations of Trælanípa and Bøsdalafossur. Day 5: Wednesday 29th May 2018. Following breakfast, we travel to Funningur and Gjogv. Spectacular views in the highest and most mountainous region of the Islands, every turn reveals breathtaking views. *Please note that although I aim to give you the most immersive Faroe Islands experience, it is possible due to the vagaries of the changeable weather and other events beyond my control that this outline itinerary may be subject to revision or change without notice. Fun, adventure, exploration with inspirational landscape and travel photography tuition by professional landscape photographer and author, Steve Walton. Join us for this unforgettable Wild Light Photo Tour experience in the Faroe Islands from 25th-29th May 2019. Balance: £1500 payable on 1st February 2019. What is not included: equipment, insurances, your return air travel, evening meals, lunches, alcoholic beverages & snacks. Payment: bank transfer. Please contact me for booking forms and full details. Late bookings: bookings made 10 weeks or less from the workshop start date must be paid in full at the time of booking. Cancellations: deposits are non-refundable. Cancellation of a booking within 10 weeks of the start of the workshop will be subject to a cancellation fee of 80% of the balance. 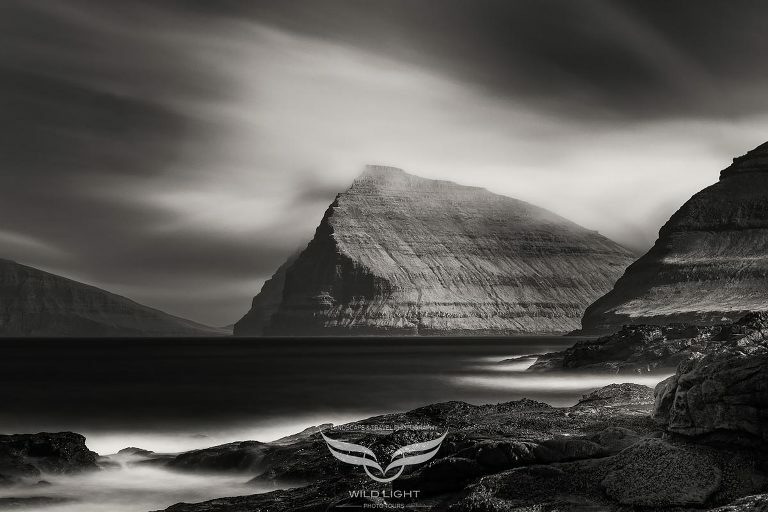 Our 2019 Wild Light Faroe Islands photography workshop begins at 9.15am on Saturday 25th May. Direct scheduled flights from Edinburgh to Vagar are operated by Atlantic Airways (flights are not included in the cost of the workshop). Flights can often be fully booked quite far ahead and are more expensive closer to departure dates, so it is a good idea to book your return flights as soon as possible. Other destinations from Vagar usually involve stopovers in Copenhagen, some of which are quite lengthy and you may need overnight accommodation. If you are arriving on the Atlantic Airways scheduled flight from Edinburgh on Friday 24th May 2019, you will need to arrange an evening meal and accommodation for the night of 24th May. There are several options close to the airport, Hotel Vagar is very convenient and locally the most expensive and a range of B&B’s and a hostel are close by at Sandavagar and Sorvagar. Accommodation close to the airport also books up well in advance and you should arrange this as soon as you can. It is your responsibility to arrange your transfer to Hotel Streym in Torshavn in time to begin the workshop on Saturday 25th May 2019 at 9.15am. The workshop ends on Wednesday 29th May 2019. If you are staying on for the nights of Wednesday 29th and Thursday 30th May, please arrange your accommodation and your transfer to the airport for your return flight to Edinburgh or other destinations. There are taxis, a shuttle bus and a scheduled bus service to the airport. Please note that additional accommodation and airport transfers are not included in the cost of the workshop. Hotel Streym is a popular hotel and rooms book up well in advance, so be sure to reserve your room if you are extending your stay before the workshop until 25th May or after the 29th May 2019. To reserve your place on my next Faroe Islands landscape & seascape photography workshop, please contact me on +44 (0) 1162994901, email steve@stevewaltonphotography.info or submit the contact form. Numbers are restricted to four participants and it is advisable to book early to secure your place on the 2019 workshop.